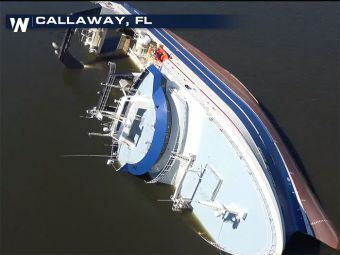 Both of Panama City, FL, headquartered Eastern Shipbuilding Group’s shipyards have been damaged by Category 4 Hurricane Michael. 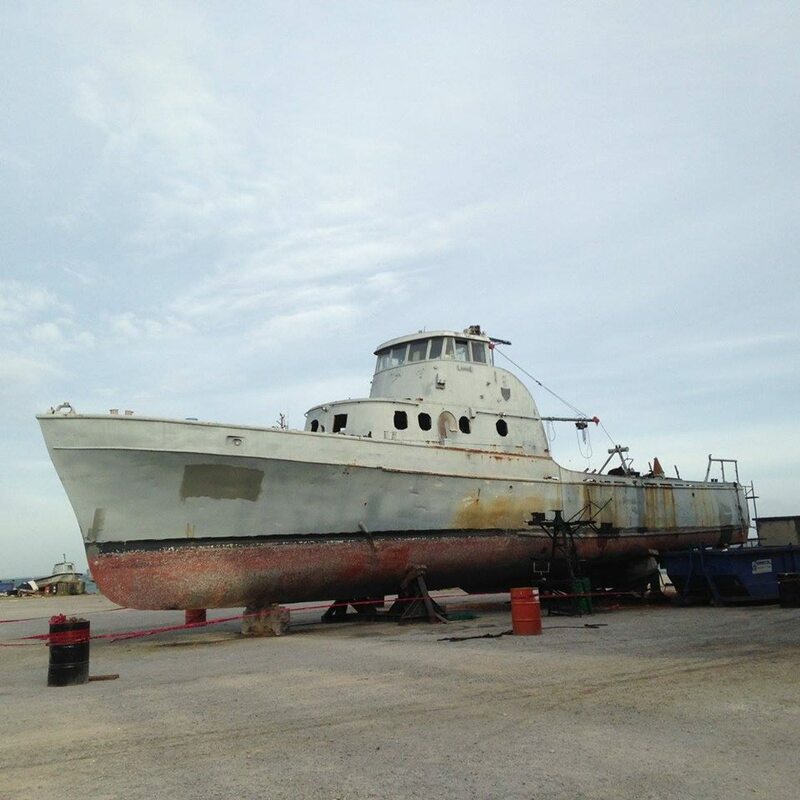 Just one indication of the severity of the storm: The 261-foot Alaska factory trawler North Star, which had been nearing completion at Eastern, was pictured resting on its starboard side in the waters of Saint Andrews Bay, FL, October 12, after being swept from its moorings. Eastern was of course awarded a contract for detail design and construction of the first of the Offshore Patrol Cutters with options for eight more. No idea how this will affect the project. 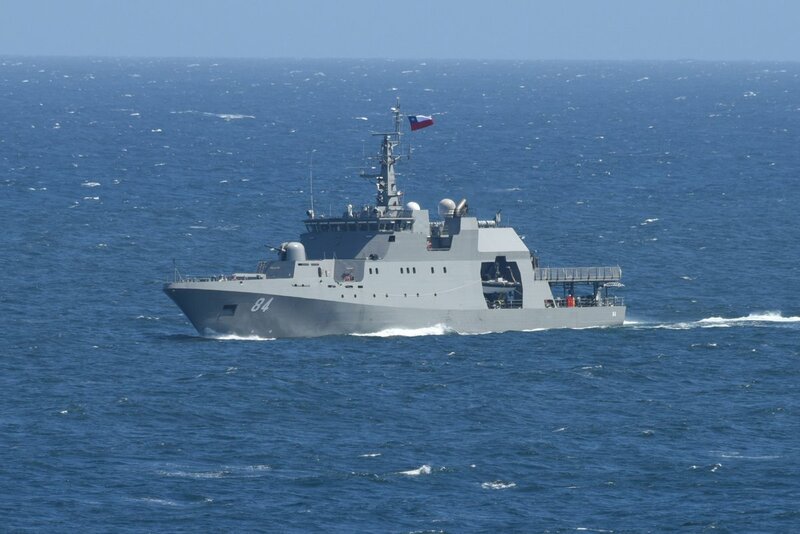 The Philippines has a requirement for six new ocean-going Offshore Patrol Vessels, and the Austal shipyard in the Philippines is making an offer. Their design is 81.7 meters (268 feet) in length overall, with a beam of 13.3 meters (43.6 feet), and a draft of 4 meters (13.1 feet), so, similar in size to the Bear class cutters, with perhaps slightly greater displacement. The illustration shows a ship armed with a 76mm Oto Melara Super Rapid naval gun, and two auto-cannon. It has a helicopter landing deck but no hangar. It is apparently equipped with a stern boat ramp and boat davit starboard. There is no information on speed, but I would guess 20 to 22 knots on a pair of diesels. Its fast, its composite construction, and its slightly longer, but lighter, than our Webber class. I don’t see either weapons or a boat. 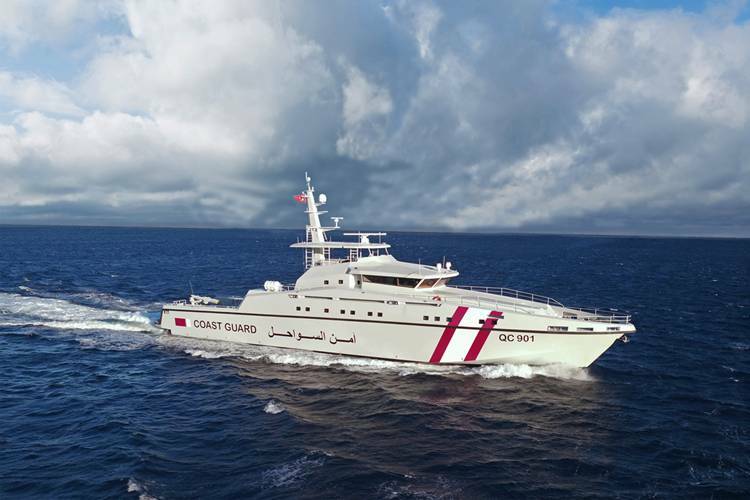 Four new Offshore Patrol Vessels (OPV) projects, totaling 20 vessels, have been reported. 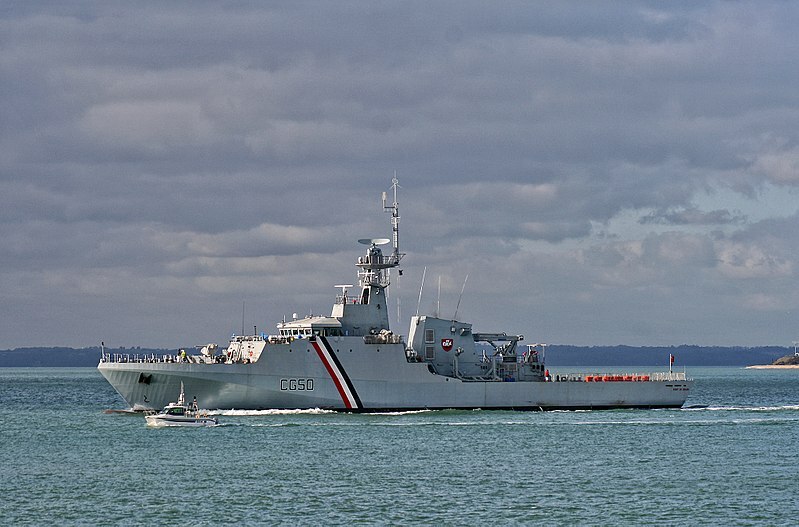 NavyRecognition reports the French Navy has issued a Request for Information preparatory to procurement of six OPVs to operate from French overseas territories. They are seeking 22 knot vessels about 70 meters (230 feet) in length with facilities to support a vertical take off and landing (VTOL) unmanned air system (UAS). Given France’s recent history with OPVs these may look a lot like Offshore Supply Vessels. 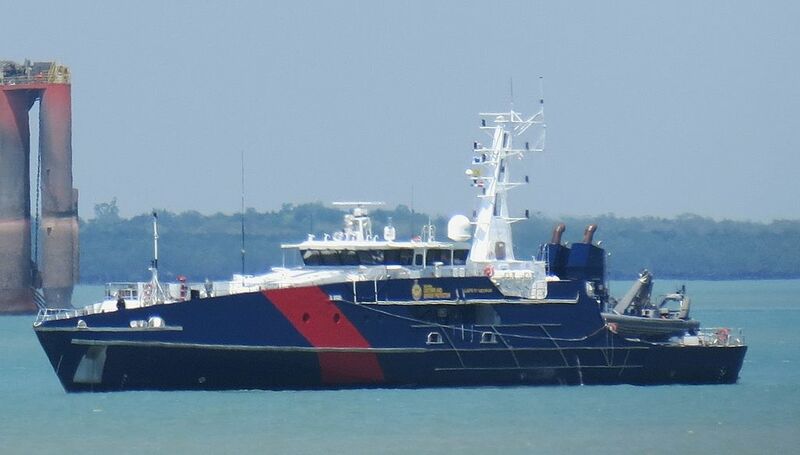 Australian Shipbuilder Austal has been contracted to build two Cape Class OPVs (illustrated above) for the Trinidad and Tobago Coast Guard. These are 58 meter (190 foot) 25 knot vessels with a 4,000 mile range. Ten have already been built for the Australian Navy and Border Force. It appears Austal’s yard in the Philippines may be building six 80 meter OPVs for the Philippine Navy. These would reportedly be based on the Cape Class Patrol Vessels, but would be much larger, have steel hulls, and helicopter support facilities (helo deck certainly, but not clear if that would include a hangar). India is planning to procure six “New Generation Offshore Patrol Vessels.” It sounds like these will evolve from the Saryu Class OPV which are 2,230 tons displacement, 344 feet in length, 42 foot of beam, with a 12 foot draft with a speed of 25 knots. The Saryus are armed with a 76mm Oto Melara gun and two Soviet designed AK-630, 30mm six barrel Gatling guns (just forward of the funnels in the photo). They also have a hangar and flight deck for a HAL Dhruv medium weight helicopter. The new ships should be at least equal in capability. British built OPV that was to have been the Trinidad and Tabago Ship (TTS) Port of Spain, seen here in TTS colors. Now the Brazilian Ship Amazonas. 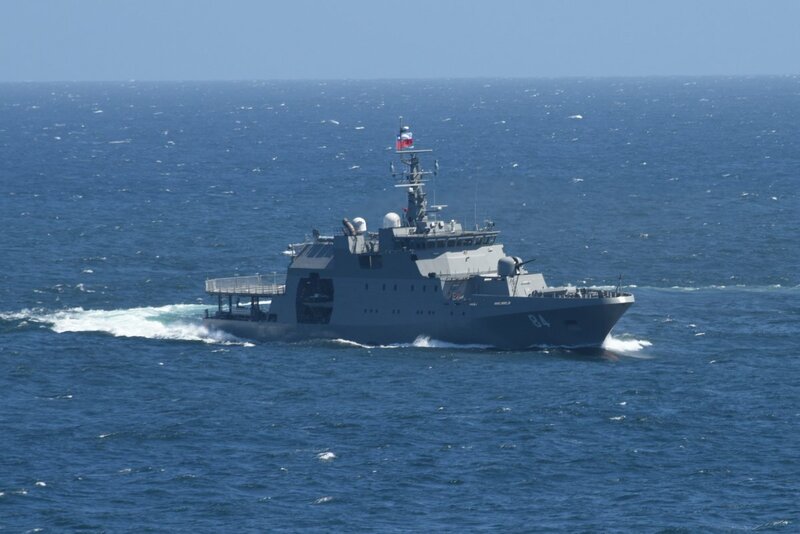 At the Visakhapatnam International Fleet Review 2016, a ship graced the show with her presence – the Brazilian Navy Offshore Patrol Vessel (OPV) BN Amazonas (P120) commanded by Commander Alessander Felipe Imamura Carneiro. While this ship would have gone largely unnoticed by the naval fraternity so gathered, being as it is, of sound but unspectacular design and performance, the vessel has a peculiar significance for the Trinidad and Tobago Coast Guard (TTCG) as it was originally built for the said formation and was very nearly commissioned as the TTS Port of Spain. However, an abrupt and controversial cancellation of the order in September 2010, following a change in government in May 2010, brought an end to a planned expansion plan that would have allowed the TTCG to regain its place as the premiere naval unit of the Caribbean. The cancellation of the OPV contract combined with poor serviceability of surviving assets led to a scramble for assets between the years 2013 and 2015 which culminated in the procurement of a fleet of vessels that have restored a degree of capability and viability to the TTCG surface ship squadron. Trinidad and Tobago claims an Exclusive Economic Zone (EEZ) of up to two hundred nautical miles (200 n.m.). The territorial sea limits are up to 12 nautical miles from the archipelagic baseline. Internal waters, of up to 3 nautical miles from the archipelagic baseline are also part of the responsibility of the Coast Guard. The offshore oil and natural gas sectors are estimated to provide some 48% of the revenue of the Government of Trinidad and Tobago. Under the 1979 International Convention on Maritime Search and Rescue Trinidad and Tobago has an area of responsibility 68,500 sq nautical miles. Trinidad and Tobago also has obligations under the ICAO for search and rescue. The connection between drug trafficking and violent crime is obvious. Equally well known are the destabilizing economic and socio-political effects of the corruption and social degeneration that follows in its wake. Contrary to popular belief, The majority of drugs smuggled into Trinidad are transported, not by small fast boats, but by large, slow transport vessels. They are also transported by aircraft, submersibles, and fishing boats. 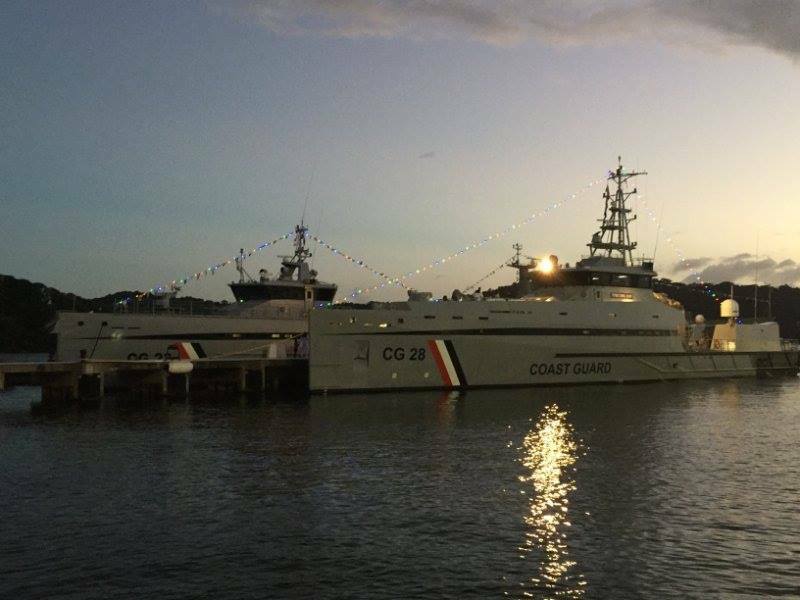 Until 2016, the ability of the Trinidad and Tobago Coast Guard to intercept this multiplicity of smuggling avenues was severely limited, particularly along the South and East coasts. Furthermore, civilian marinas also provide a largely unpoliced entry route for illegal narcotics. Thus, acquiring the capability to stop the transshipment of narcotics (primarily from South America to North America and Europe) through local waters and reducing the associated arms and ammunition trade locally, is the key immediate goal of the TTCG. Trinidad and Tobago claims an EEZ consistent with the United Nations Convention on the Law of the Sea. It must therefore carry out surveillance to the extremities of its EEZ (out to 200NM) to prevent unauthorized and illegal activity. Encroachments into the EEZ are always a possibility with Barbadian and Venezuelan illegal exploitation of local fisheries having occurred with regularity. The main routes of ingress and egress in the human trafficking trade are by sea. Illegal immigration from the South American mainland by sea is increasing. An increase in illegal immigration and human trafficking has been observed within local waters. Worldwide, the emergence of a widening range of non-state actors, including terror networks and criminal gangs has prompted a major shift in National Security Policy. These threats cannot be ignored and it can be expected that TTCG vessels may be deployed to support Counter Terrorism operations locally and regionally. Piracy has not happened to any noticeable extent, but there have been incidents within the Caribbean. Maritime crime, however, is not uncommon and needs to be addressed by deployment of Coast Guard assets. Maritime crime has been occurring in the cross border areas of local waters. 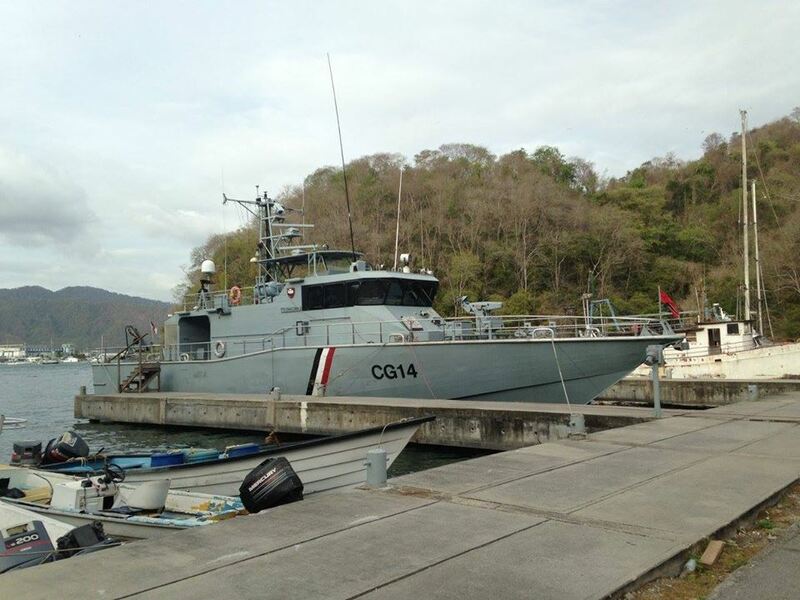 The Trinidad and Tobago Coast Guard began its operational history with two 103ft Vosper Ltd patrol boats – the TTS Trinity (CG-1) and the TTS Courland Bay (CG-2) – commissioned on 20th February 1965, each 31.4m long, displacing 123 tons. These were followed by TTS Chaguaramas (CG-3) and the TTS Buccoo Reef (CG-4), commissioned on 18th March 1972, each 31.5m long, displacing 125 tons. CG-1 and CG-2 were decommissioned in 1986 and CG-3 and CG-4 in 1992. These Vospers were followed on 15th June 1980 by two modified Spica class vessels – TTS Barracuda (CG-5) and TTS Cascadura (CG-6) – each 40.6m long and displacing 210 tons. After a failed attempt at local repair and refurbishment, these vessels were decommissioned after nearly 15 years of inactivity. CG-5 was scrapped while CG-6 remains at Chaguaramas Heliport completely derelict, bereft of sensors, engines, weapons and accommodation, yet the vessel remains ostensibly in commission. On 27th August 1982, 4 Souter Wasp 17 metre class (TTS Plymouth CG27, TTS Caroni CG28, TTS Galeota CG29, TTS Moruga CG30) were commissioned. In addition, the Coast Guard was augmented in the mid-to-late 1980s with vessels from the disbanded Police Marine Branch – 1 Sword Class patrol craft (TTS Matelot CG 33) , and 2 Wasp 20 metre class (TTS Kairi CG31 & TTS Moriah CG 32). All of these vessels have now been decommissioned. The years 1986 to 1995 saw the decommissioning of almost all the TTCG patrol assets and the de facto retirement of CG-5 and CG-6 for lack of serviceability and an inability of the TTCG to undertake routine maintenance due to severe funding shortfalls. This left the formation incapable of performing its assigned tasks on any sort of credible basis. This period, not surprisingly, saw a significant increase in narcotics and illegal weapons shipments being transhipped through Trinidadian waters. After a number of years with almost no serviceable vessels, the period 1999-2001 saw the TTCG receive a boost with the acquisition of the ex-Royal Navy Island class OPV, HMS Orkney as the TTS Nelson (CG-20) and four 82ft Point-class cutters, each displacing some 66tons, from the United States (TTS Corozal Point CG7, TTS Crown Point CG8, TTS Galera Point CG9 and TTS Bacolet Point CG10). The Point class cutters were nominally on strength until 2009-10 when they were decommissioned, but in reality, they had been unseaworthy for some years prior. A half-hearted attempt was made to refit CG-7 but was abandoned. It is a depressing fact that these vessels were well over 20 years old when procured. The stark reality was that not a single new-build patrol vessel was acquired between 1980 and 2009. In 2003-2004, the then Government of Patrick Manning, began a phased expansion of the formation which included the purchase of six new Austal PB30 Fast Patrol Craft (FPC) –CG11 TTS Scarlet Ibis, CG12 TTS Hibiscus, CG13 TTS Humming Bird, CG14 TTS Chaconia, CG 15 TTS Poui and CG16 TTS Teak – commissioned between 2009-2010 and two modified oilrig support vessels – each over 15 years old – armed and re-tasked as Coastal Patrol Vessels (CPVs) – CG-21 TTS Gaspar Grande and CG-22 TTS Chacachare – commissioned on 23rd April 2008. In addition, 4 Midnight Express Interceptors were delivered in 2005 and were extensively deployed in anti-narcotics operations. The “crown jewels” of this expansion plan were three 90m long OPVs – to be named the Port of Spain, Scarborough and San Fernando – ordered from VT Shipbuilding (later BAE Systems Surface Ships). Easily the most advanced vessels in the Caribbean (after the demise of the Cuban navy), the OPVs were adequately armed with 25mm and 30mm guns and possessed the ability to stage medium-lift helicopters from their flight decks. However, an overly-ambitious integrated fire-control system and some unrealistic expectations from the TTCG in respect of the performance of the 30mm guns led to significant delays and problems during trials. In September 2010, the Government of then Prime Minister Kamla Persad-Bissessar, cancelled the contract in decision that in retrospect may have been ill-advised. Of interest is the fact that the procurement of new vessels did not lead to a commensurate increase in the TTCG operational budget relative to the larger fleet. In addition, archaic bureaucratic procedures together with shortcomings in the TTCG engineering and maintenance branches combined to cripple efforts to restore serviceability to repairable vessels with contractors going unpaid for work done and vessels being laid-up for extended periods of time. Procurement and payment procedures and policy have also played a significant part handicapping the ability of the TTCG to meet its commitments to suppliers and contractors, largely because of a bureaucratic system that moves slowly and which fails to accord due priority to essential items necessary for the operations of the TTCG. It is a continuing area of concern that there has been no attempt to streamline urgent procurement or even payment of suppliers with basic necessities such as fuel running dangerously low on occasions. The then government attempted to circumvent these problems by entering into comprehensive logistics and support arrangements with VT and Austal. However, the former was stillborn through the cancellation of the OPVs and the latter never worked as planned, in part because of inherent deficiencies in the TTCG maintenance structure and in part because of unreformed bureaucratic processes that ensured that the TTCG was unable to meet its contractual obligations in respect of the Austal support contract. Interceptors 17 2-4 Inshore & Internal Waters 4 serviceable, 13 unserviceable. In January 2014, the Government appointed the Naval Assets Acquisition Implementation Team (NAAIT) and tasked them with procuring, inter alia, 7 new CPVs and 2 OPVs (now curiously termed Long-Range Patrol Vessels or LRPVs) within the very short period of two years. For budgetary reasons the figures were reduced to 4 CPVs and 1 LRPV. The new procurement attracted some international attention and shipyards invited the NAAIT to inspect the yards and the products available. Directed by the Government, the NAAIT visited the Hyundai Heavy Industries (HHI) shipyard in Ulsan, Republic of Korea, the China State Shipbuilding Company (CSSC) in Guangzhou, COTECMAR at Cartagena, Colombia and Damen Shipyards Ltd at Gorinchem, Holland. Damen, COTECMAR and HHI offered viable products meeting TTCG requirement but CSSCs products were viewed as not quite meeting TTCG specifications. After deliberating and assessing the vessels and designs on offer, the NAAIT recommended that the 4 CPVs be acquired from Damen with two additional vessels of a similar design being acquired as “utility vessels” but so armed and equipped that they could augment the 4 dedicated CPVs in the patrol role. The vessels selected were the SPa 5009 CPV and the FCS 5009 utility vessel. The CPVs were fitted with a surveillance system which drew heavily on high-end civilian products. In addition they were fitted with a remotely controlled 20mm gun. The FCS 5009 was delivered in standard configuration but with accommodation increased for a larger crew, a manually operated 20mm gun (from TTCG stocks) and a slightly enhanced surveillance fit. 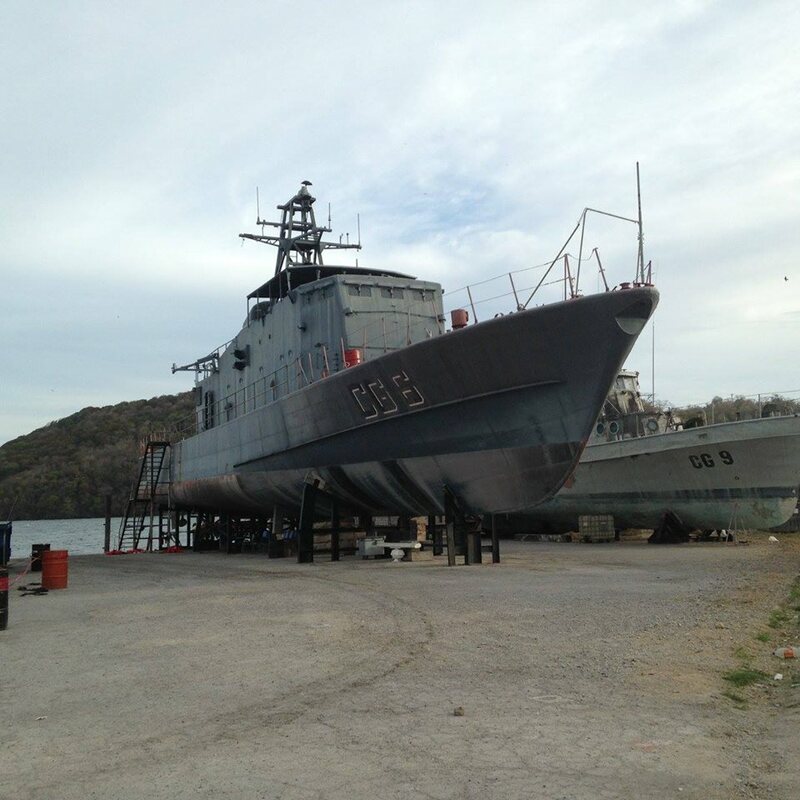 The LRPV procurement was not so fortunate as the NAAIT recommendation for a formal Request for Proposals to be sent out to all the shipyards visited by the team was initially approved and then, to the surprise of the NAAIT, circumvented by the direct intervention of Prime Minister Persad-Bissessar who decided, against advice, to procure a ready-made, unarmed, LRPV from CSSC of China which compared badly with the cancelled OPVs. Technical expertise must be an integral part of the procurement process and operate in conjunction with bureaucratic procedures. The bureaucracy must be willing to learn and understand requirements of military formations. They may not be technical experts but complete ignorance on the part of the bureaucrats involved will inevitably lead to frustrating delays. Bureaucratic lethargy is potentially lethal to any procurement process. It may be necessary to stipulate time frames for tasks and hold officials to account. This will inevitably meet with resistance from the affected parties. Bypassing the bureaucracy is not an effective option. A bureaucracy that does not feel part of the system can create additional delays by questioning the legality of the procurement being undertaken. Complete synergy of effort has to be sought. Political interference must be avoided where possible. The NAAIT experienced the effects of this where technical advice was overruled and a questionable purchase of the LRPV from CSSC China was initiated by the then Prime Minister. Above all, never let military formations decay to the extent where urgent procurement becomes necessary to restore even a veneer of capability. Rushed procurements have the potential to be as detrimental as delayed ones and run the risk of being questioned by successor governments. One of the most intriguing points to note is that the TTCG followed a systematic and rational procurement process until 1980. After that, its recovery from decades of neglect has been slow, painful and littered with the false dawn of the ill-fated OPV contract. Nonetheless, the frantic efforts to rejuvenate the TTCG have finally produced results. It remains to be seen whether the new vessels will meet a better end. , Andres In April 2014 a guest author, Andres Tavolari, provided one of our most popular posts, about a multi-national program to build OPVs to a German design, the 264 foot Fassmer-80. 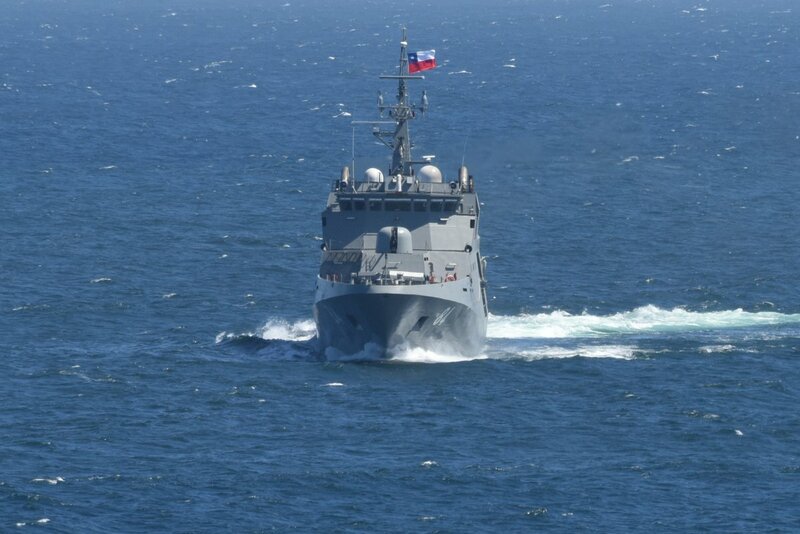 Andres has provided pictures of the latest Chilean vessel of this class, OPV-84 “Cabo Odger” which is to be the forth of a projected six. It is slightly larger than the first ships of the class at 1771.6 tons. She is also ice strengthened and is equipped a recycled 76mm and different radar and communications systems. This class is one of three contenders for Australia’s OPV program. The Indian Navy has announced the launching of the first two of a new class of five Offshore Patrol Vessels (OPVs). Three more of the class are expected by the end of the year. 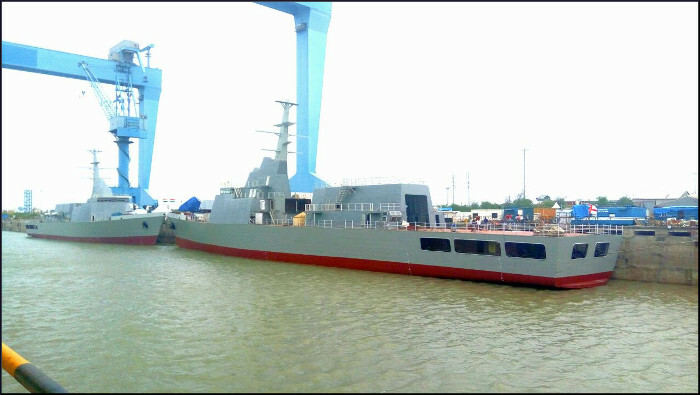 Within the Indian Navy, these are unique in that they are being built by a private, rather than a government, shipyard. Wikipedia reports that these vessels are 110 meters in length (Same as the Offshore Patrol Cutter) with a displacement of 2000 tons (this appears to be light displacement). They are armed with an OTO Melara 76mm super rapid gun mount (SRGM) and two 30mm AK-630M six barrel Gatling guns. 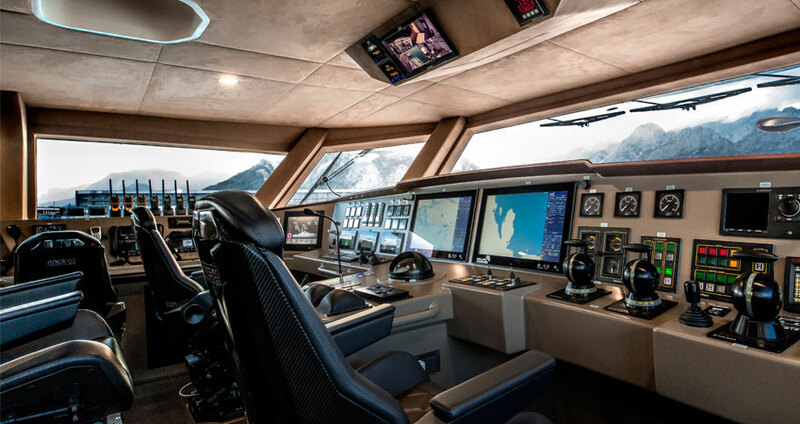 It is powered by twin diesels 18,200 kW (24,400 HP) for a maximum speed of 25 knots. India has both a Coast Guard and a Navy, and both operated Offshore Patrol Vessels. The Coast Guard was established in 1978 and operates under the Ministry of Defense. Indian CG OPVs tend to be more lightly armed than their Navy counterparts. The Indian Navy currently operates ten Offshore Patrol Vessels. The Indian Coast Guard currently operates 16 Offshore Patrol Vessels and three larger “Pollution Control Vessels” which also function as OPVs. The oldest of the Indian Coast Guard OPV was commissioned in 1983. The oldest Indian Navy OPV was commissioned in 1989.